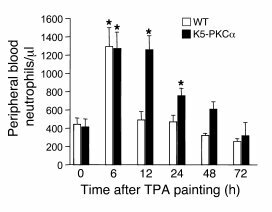 K5-PKCα mice develop a sustained neutrophilia in response to TPA painting. A single dose of TPA (1 μg) in acetone was applied to the shaved backs of K5-PKCα transgenic mice and WT littermates. Blood was drawn at various times, and differential wbc counts were performed. Bars represent the mean number of neutrophils per microliter of blood ± SEM for at least 7 mice per group for each time point. *P < 0.05 versus the respective control.